Many years ago, I was up to my ears in it–work, college, and an impending wedding. I had a lot going on. The groom was away a lot, and it was my birthday in the middle of the week. I didn’t get around to a birthday cake, but I did have something special: a big, ripe, green avocado, sprinkled with sea salt. That’s all it needed. I waited a couple of days to eat it, to make sure it was ready. It was. At my little dining table, all by myself, with my felines wondering what I was doing and what that smell was. It was SOOOOOO good. Soft. Creamy. Tasty. Full of fresh, green flavor. With salt. I only looked up the calorie count a couple of days later. I would have consumed less calories with a slice of cake, but that’s OK. Worked for me! I had a similar, albeit lower-calorie, experience this week. Pears are a nice, lesser-loved second cousin to apples. Some folks like them, some don’t. Pears are available in pear brandy and pear balsamic vinegar. But apples and oranges are more popular. But if you ask most folks what their favorite fruit is, you likely won’t hear “pear” out of too many of them. On Sunday, while stocking up on some economy-size supplies at Central Market, I prowled through the produce section last, because I knew what I wanted and I got it first. Now, sometimes they have non-standard things, like truffle mushrooms (at about $250 a pound, no kidding), Italian cipollini onions and Meyer lemons. Central Market is a Texas haven for unusual and hard-to-find ingredients. But of course they have those right next to the regular onions, sweet potatoes, lemons, limes and grapefruit. This is nirvana for a foodie like me. Pears are in season, and while you can get them all year long (fresh or in cans), when pear- based desserts show up, it’s usually fall and the holidays. I like pears, but I don’t buy them often, I guess because I don’t want them to go to waste. They’re a bit like strawberries, you can’t keep them fresh or in the fridge too long. Look how beautiful. . .a burnished red and twice the size you normally see. I couldn’t get a good shot of the ruler, but off the stem, it’s about 6″ long. 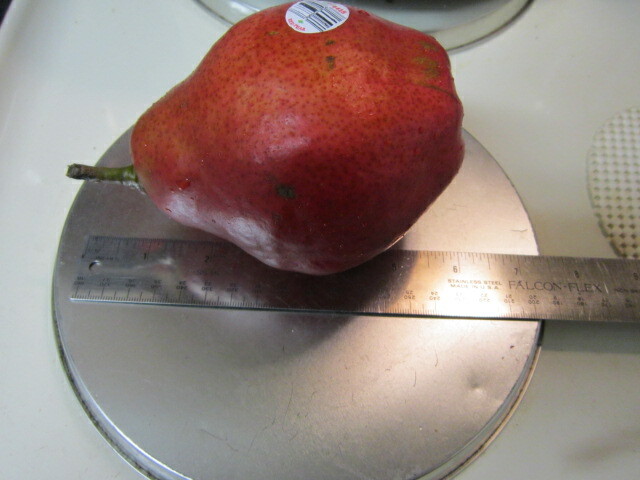 I took my tape measure and also got the girth, which was 11.5″. That’s right, it was just under one foot around the middle and just under 6″ in length. Never having seen one that big before, I got one. JUST one. They were $1.99 a pound, and, well, it was just over $2. A little splurge. I put it out to ripen a little, and, well, yesterday I couldn’t wait. I got a big knife and diced it all up in large chunks after cutting out the central seed and stem. I ate this beautiful creation as is, raw, with nothing on it–no sugar, sweetener, or spices. I consumed it as Mother Nature intended. I should have waited a couple more days. Not quite softened, and not as sweet as it could have been, but it was still pretty darn tasty. Now, if pears are your thing, and you want a nice little dessert for pears, here’s one called Chocolate Pear Pudding that’s easy to make and uses canned pears and other pantry ingredients. I’ve made it a few times and folks love it; it always disappears. But sometimes, all it takes is something simple like a small container of sweet berries, a fresh pineapple, a crisp, striped apple, or a big, ripe pear to really hit the spot.